Before you get too relaxed for the summer days ahead, I wanted to share a few little googly things you can do to get a jump start on the new school year. Of course, you shouldn’t spend your summer just working. But a little bit of work mixed with a lot of fun will keep you fresh and prepared for the new school year. So, after you’ve taken a few days or weeks to decompress, try some of the following. I can’t say enough about the power of reflection. However, you might be thinking that the last thing you want to do is look back on the school year that just ended. But it will definitely help you identify a few areas to grow in. 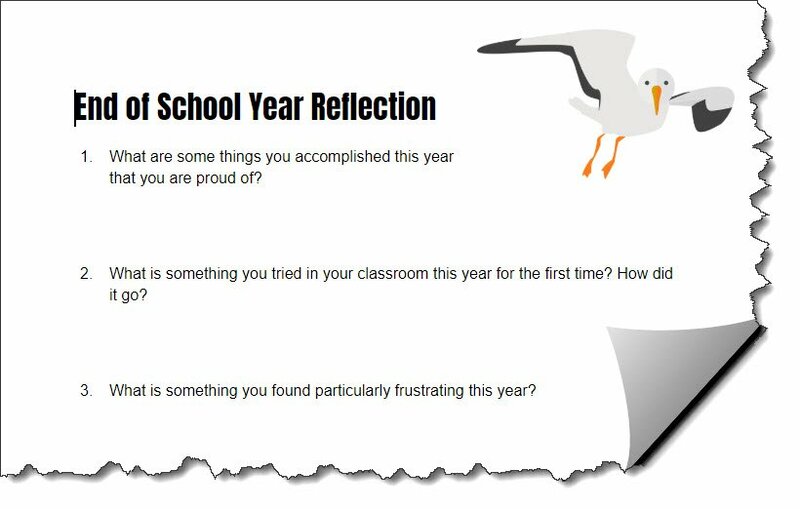 Make a copy of this Teacher End of School Year Reflection Google Doc. Take a few moments, while lying on the couch or sitting out by the pool and answer the questions. You don’t actually have to look at it again anytime soon. At least you have reflected on the previous school year and know what to tweak next year. 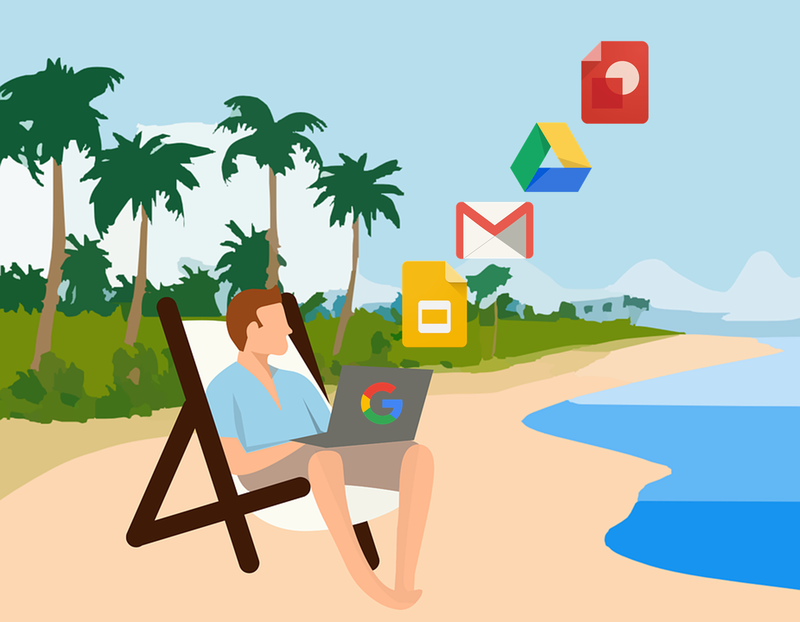 Summertime is a perfect time to get your Google Drive organized. Sometimes our files get scattered everywhere and we need to organize them to make our drive more manageable. Even if you are a super organized person (like I try to be), you might still want to take a look to see if your Drive needs any tiding up. I know I always find things I need to delete or put into folders. If you need any help, check out these Three Tips to Organize Your Google Drive. As we all know, Google Drive has so much to offer. After your drive is organized, ask yourself if you are taking advantage of the full potential of Google Drive. For example, did you know that you can create badges right inside of Google Drive? Did you know that Google Drive has a gallery of templates you can use? If you answered “no,” then check out Five Google Drive Tips You Should Try and Be More Productive with Google Drive in 2018. If you are like the amazing Lexi Law (@lexilynnlaw), fifth grade science teacher at Wichita Fall ISD, and spend a pretty penny on a paper lesson planner but never use it, then you’ll definitely want to try this. Lexi created a Digital Teacher Lesson Planner in Google Drawings. 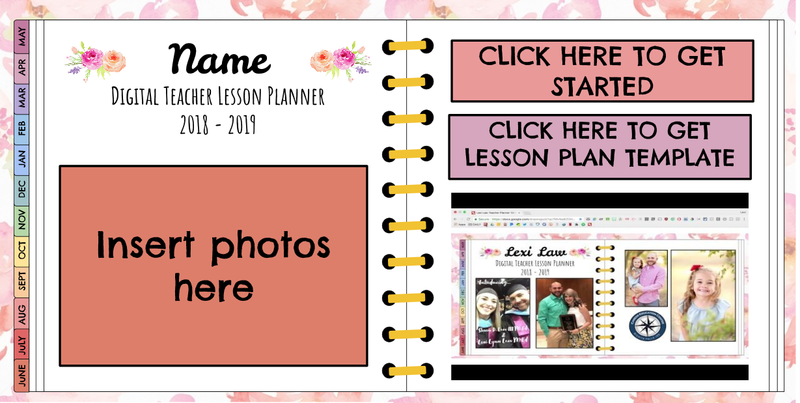 The planner is for the 2018-2019 school year and all you have to do is make a copy of her template to get started. There is even an area where you can personalize your planner with photos. If you need extra help, Lexi even created a how-to video. I’m with Lexi on this one . . . why spend money when you can do it digitally with Google? Google does a lot of updating to its products throughout the year. For example, Google recently redesigned Gmail to help you respond to email even quicker. You can now see and click attachments in your inbox before ever opening a thread. You can also hover over messages (you don’t have to click into them) to do things like RSVP to a meeting invite, archive an email thread, or snooze an email. In addition, updates and improvements were made to Google Docs, Google Slides, Google Sites, Google Drive, and more. If you didn’t get a chance to see the new updates, now is the perfect time to read all about them on the G Suite Updates Google Blog. Furthermore, check out the What’s New in G Suite Monthly Newsletter. You don’t have to be an avid reader for this last thing on the list. All you have to do is read one or two TCEA TechNotes blog posts a week. That way, you can catch up on those blogs you might have missed during the school year. You can find all the blogs related to Google by doing a search for the word Google on the TCEA TechNotes Blog. To make it even easier, we have Our 2017 Google Resource Round Up and Our 2016 Google Resource Round Up, which are a compilation of all blog posts about Google for that year. These are just five googly things you could do this summer to help you get a start on the new school year. Do one or two or do them all. You’ll be glad you did.